Apple's iPad line might have given some ground to the influx of affordable Android slates in the US last quarter, but with the rehash of the new iPad and the cheaper iPad mini launch in Q4 the ratio will most probably rise up again in the iPad favor, just like in the spring when the 3rd gen iPad launched. Not only that, but Apple's tablets are seemingly making strides in China, says Analysys, after the naming scheme patent resolution with ProView. The third quarter saw the Chinese tablet market increase 62.5% year-on-year, and the whopping 71.42% of those sales went to Apple. 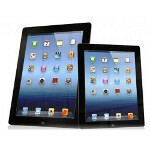 We can only imagine what will happen this quarter, with the cheaper iPad mini there, and the iPad 4 launch. Next in line is, naturally, the country's favorite Lenovo, followed by the Eben brand, which is hardly heard by anyone outside of China, but is making pretty decent sales anyway. I think perhaps this is number only for branded tablets? I've been to Shenzhen and went to the computer market. There were all sorts of tablets, phones are sold and people buy them in droves. I don't have any number but I believe many more people are using unbranded tablets or tablets of small brands.